Copper plated handles make this pan an eye-catching addition to your table. Use it to cook in and serve or simply use it as a serviing dish! Might add a tsp. of cocoa and coffee to rub for a little twist. It will bring out more flavor in other ingredients that people just won't be able to put their finger on identifying. 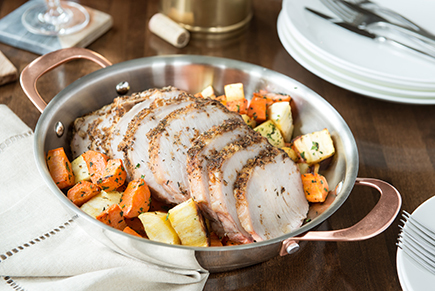 A great holiday dish that feeds a party and is easy to execute. Remove and allow to rest covered for 10-15 minutes. Slice and serve. On a large baking sheet, toss carrots and parsnips with oil, salt and pepper. Roast at 375°F for 25-35 minutes, or until just tender. Remove and toss with parsley and serve.